King BEEch King BEEch View Pool & Hot Tub Kitchen Kitchen w/2 Refrigerators Dining Area Seats 8 Great Room w/Flat Screen TV Great Room Upper Level Master Bedroom Bedroom Bedroom Mid Level Master Bedroom Bedroom Mid Level Master Bedroom Mid Level Master Bedroom Mid Level Master Bedroom Mid Level Master Bedroom Lower Level Bedroom Lower Level Bedroom Lower Level Master Bedroom Mid Level Living Room Mid Level Living Room Rec Room with Pool Table Pool Table & Wet Bar Rec Room Upper Level Master Bath Mid Level Master Bath Mid Level Master Bedroom Hot Tub Volleyball Court Horseshoes Mid Level Deck Backyard Beach! 4 Masters (2 w/King, 2 w/Queen), 1 w/King, 1 w/Pyramid Bunk, 1 w/Bunk and Twin, Sleep Sofa. Sheets and Towels Provided, Beds Made. NEW IN 2019: Outdoor TREX decks! Welcome to your vacation getaway! Step into spacious beach living with your own outdoor paradise. 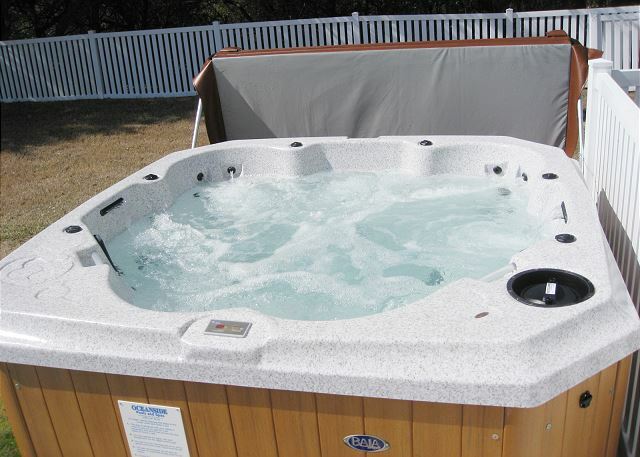 Lounge by your private salt water pool or unwind in the hot tub. Test your outdoor competitive streak in volleyball or horseshoes, shoot a game of pool in the game room, or visit the community tennis courts. The family dog will love the fenced in backyard. Oh, and don't forget the beach - it's only a quick walk across the street. There is something for everyone at this exceptionally equipped beach home. The keyless entry provides you with "straight to the house" check-in and 24/7 easy access for everyone staying at King BEEch. The kitchen makes vacationing easy with 2 refrigerators, 2 dishwashers, and plenty of conveniences. The wireless Internet allows you to keep in touch with the rest of the world that's missing out on your summer escape. Keep the kids busy with games, DVDs, Play Station 2, and toys. Relax and enjoy the ocean views while reading a book from the library, or watch a DVD on the flat panel HDTV. With common areas on every level, this house is great for large families or families traveling together. If you want to experience all that's offered, use the parking permits for the beach accesses at the sound and ocean, and visit the shopping and restaurants conveniently located in Duck and Kitty Hawk. Enjoy your stay at King BEEch! Other amenities: All Master Bedrooms w/Balconies (2K,2Q), 2 HD Plasma TVs, Saltwater Filtration Pool, Large Grill /Propane Provided, Large Fenced In Backyard, Playground, Sand Volleyball, Large Parking Area, 300 Yards to Beach, Beach Access Parking Permits, Community Tennis, Dogs Welcomed. 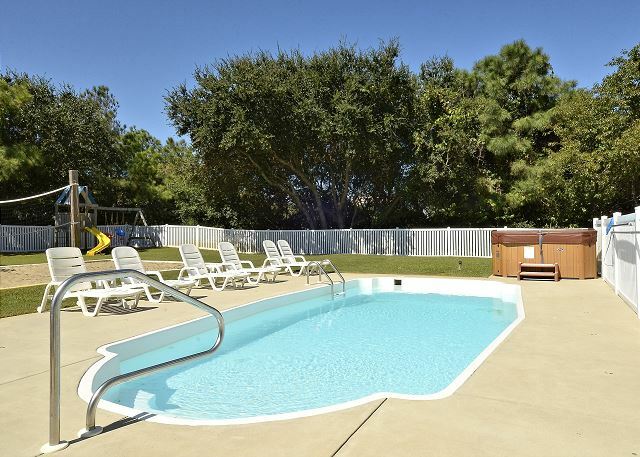 Outside: Pool, Hot Tub, Volleyball Court, Large Fenced in Back Yard, Playground, Horseshoe Pit, Grill, Outside Showers. Lower Level: Rec Room w/Futon, Pool Table, Wet Bar and Refrigerator. Washer/Dryer, King Bedroom shares Full Bathroom w/Twin Bunk and Twin Bedroom, Pyramid Bunk Bedroom has Private Door to Full Hall Bathroom. Mid Level: Living Room w/Sleeper Sofa, 2 Master Queen Bedrooms w/Private Decks, 1 Master King Bedroom w/Deck, Hall Bathroom. Upper Level: Living Room w/Fireplace, Front Deck, Dining Area, Kitchen w/Breakfast Bar, Back Deck, Master King Bedroom w/Private Deck. A perfect gathering place for family of 3-4. Douglas, thank you for sharing your experience with us! We are so glad you had a great time! We hope to see you again soon! Rental was as described. Only issue was spiders (a lot of them and nests) on the playground equipment. Called the property mgmt company and someone came out three days later. Didn't stop our fun, and was out only complaint. Thank you for taking the time to provide us feedback regarding your recent stay at "King BEEch." We are thrilled to hear that you enjoyed your time spent here on the Outer Banks! There is nothing more memorable than family time at the beach. Beautiful Home with all the Amenities!! This home had everything we needed and more! We hosted a family reunion of 50+ guests and everything got used from the board games, pool, hot tub, horseshoes, playground, volleyball court and more! The 2 refrigerators and dishwashers definitely came in handy. The rental company called on Saturday at 1pm to advise the house was ready and we could check in even though it was before the 4pm check in time. The first night, at 1am, we realized 2 of the bedrooms didn't have sheets and we called the afterhours number and they were delivered within 30 minutes. We were hesitant about calling that late at night but everyone we spoke with was very pleasant and apologetic. Even the owner called during the week to check on everything. Already discussing our next stay 2019! Dawn, thank you for sharing your experience with us! We are so glad that everything went well! We are glad that we could fix that issue quickly for you. We can't wait to see you again! We had arrived early. The rental agency said they were still cleaning the unit. I gave them my cell phone number. The agency never called. I eventually went to the house and punched the code in and entered the house. When I arrived home the agency had called my home phone in Md. Otherwise we had a great time. Beautiful, well organized house which caters to the whole famiky. So large that it accomodates multiple families. Bob, thank you for sharing your experience with us! We are so glad that your family enjoyed the home. Please come back to see us again soon! The home was great. Each bedroom has own bathroom, which allowed all to own personal residence. Backyard was fun for all ages. Showers outside were a plus to keep beach sand outside. Laundry room was so nice. Kitchen was well equipped with 2 frigerators, 2 dishwashers--able to keep all used dishes clean. It was the best vacation for all 4 families. The frig downstairs was a plus--things at finger tips for pool & outdoor fun. The house checked all of our boxes! It was very spacious for our large family. The backyard was very nice and private. Proximity to the beach was great, but the sand and water at the beach were both pretty rough and when high tide came in the beach was too short to really enjoy - made having that private pool all that more important! Mary, thank you so much for taking the time to share your feedback with us! We are so glad that you enjoyed it! We really hope to see you again soon! Rental week was very good Kitchen was well stocked. Two dishwashers and refrigerators were all used. GREAT to have baby equipment. Backyard was wonderful. Kitty Hawk Rentals would like to thank for for the feedback you have provided for King BEEch! This owner thinks of it all. From a well stocked kitchen, to baby equipment, to a wonderful back yard for all ages. We look forward to welcoming you and your family back to the Outer Banks for many more years to come. This house was perfect for our large multiple family vacation! Great to spend day at beach and hang poolside at night. Horshoes and volleyball are a plus! House was equipped with anything we needed. I do want to poin out that this area has a 10 pm noise curfew, we were unaware of that. One neighbor did say something one night but once we turned off the music, all was good! Michele, thank you for sharing your experience with us! We are so glad you had a great time! We hope to see you again soon! Wonderful time -- great weather, beautiful house, good friends to enjoy it with. Barbara, we are so glad you had a wonderful time! We hope to see you again soon! We cannot say enough good things about this rental! Very clean and well maintained, two dishwashers and two refrigerators in the kitchen were a great asset. Loved the already installed gates at the top of each stairs! Fenced back yard is great for little ones and fur babies! We loved this rental! Thank you for taking the time to provide us feedback regarding your stay at "King Beech!" The two dishwashers and refrigerators make more of a difference than some people realize. With a larger group, the additional amenities are a huge plus! We are thrilled to hear that you and your fur babies enjoyed this home and look forward to welcoming you back again in the near future! It was a dream come true. No complaind at all. From Tamara to the house , I couldn't have asked for a better group to make sure our experience was great weekend. Thank you for taking the time to provide feedback on "King BEEch" and our amazing reservation agent Tamara! We are thrilled to hear that you enjoyed your stay on the Outer Banks. King BEEch is a great property to ensure that your vacation will be memorable! We look forward to welcoming you back to the Outer Banks for many years to come. Our family thoroughly enjoyed our stay at this house. It was plenty big enough!!! Enjoyable week in a wonderful beach home! Very clean home with plenty of room. So many things to do games, video games, pool, hot tub, volleyball, books, movies and a pool table. Decks everywhere! We stayed at the house for a family reunion. The house was HUGE and accommodated everyone wonderfully. The outside was as gorgeous as the inside. The grass was perfect. Our kids loved it! The house exceeded our expectations. It was huge and clean. Loved the big yard and pool. Loved the baby gates and playground. The owner evened called to check on our stay. We are thrilled your enjoyed your stay at "King Beech!" The owner truly cares about his guests and the upkeep of his home. It truly shows at "King Beech!" There is something to do for all ages. Thank you for your review and we hope to see you again next year! We had a nice time getting away for spring break. The weather was cool, but mainly sunny. The house was comfortable and well appointed. The kids enjoyed the volleyball court, but we were off season so the pool wasn't an option. It would be nice to return in the summer. Just a short walk to the beach made dog walking easy. The only downside was that it is noisy since we were right on the main road, but overall we had a great time relaxing, exploring the Outer Banks, and would do it again. 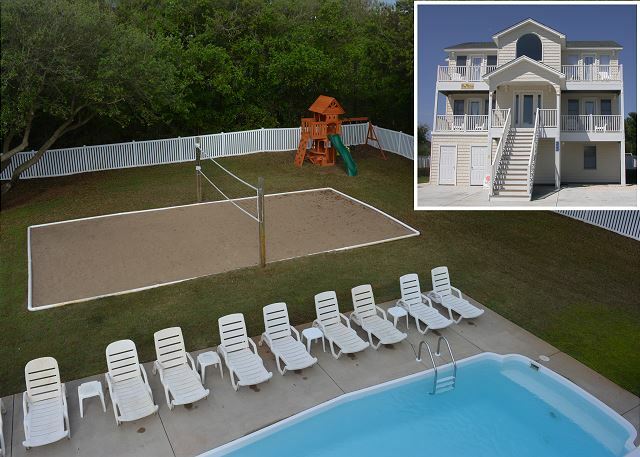 Afrter years of vacationing in the OBX, this property quickly jumped to #1 on our list! The house was very neat and tidy and no maintenance calls were required. The pool and hot tub were checked during the week and cleaned to our satisfaction. The owner of the property called us during our stay - I thought that was a nice touch. The only problem we had was w/the rental company, Beach Realty. The property has passes for beach parking, however, we couldn't find these in the home. When we called the rental office, we were told by the agent that she would have to figure it out and call us back. She never bothered to call back and we never received parking permits. If this item was in the "too hard to do box," I'm glad we didn't need to phone in a really serious problem such as a maintenance call or lock-out. This was by far one of the best rental properties we have ever had. The yard was probably the best part of the house as we had 8 children under the age of 8 and it was perfect for their needs as well as the parents. The kitchen was well stocked with 2 refrigerators and 2 dishwashers as well as plates/glasses/silverware/2 coffee pots and much more. The bedrooms were great each with its own tv. Living room had plenty of seating as well as a flat screen tv....plenty of seats for dining area....there was a renters closet with beach chairs/rafts/noodles/horseshoes. Plenty of parking area in front of house....short distance to beach with 2 public access routes (also beach parking pass). Easy access to stores/restaurants. As you can see we were very impressed. Thanks for a great stay. King Beech is a great home with so many different amenities that make it seem like a home away from home for all members of the family! There is so much to do for each member of the family and it sounds like your family thoroughly enjoyed it as well! We had a great time at King BEEch. The weather was great, the company was fantastic. We would stay at this house again. It was clean, the house was big (we had a large group), and the swimming pool was the perfect size. The house was in walking distance to the beech, the only draw back was you have to cross over Route 12. Although the traffic did stop to let you cross. We drove to Duck multiple times, had Duck donuts, went shopping in Corolla and visited a light house. Great time had by all would stay here again. Lots of family gathered to celebrate 3 birthdays.The house was very nice, lots of room for everyone. Thank you so much for taking the time to leave feedback! We love King BEEch as well. Happy Birthday to your family and we hope to see you next year!